Here there is total privacy owing to its commanding position, and views nearly all the way round, sometimes glimpsed through trees. This privacy is not easy to find in an area which is more and more sought after because of its beauty and stunning scenery. It is the setting that makes this house truly remarkable. We are close to our local hill villages, shops and supermarkets, and only half an hour from the coast. However, once you arrive you are in your own private paradise. The amount of land here protects you from the outside world, and gives children lots of space to explore without them having to leave the property. The land could be described as wooded parkland, and has a variety of indigenous trees. There are interesting walks and stone walls, making it a wonderful spot to walk or do your early morning 'constitutional' before having breakfast on the terrace. To awaken each morning to the stunning views of the mountains lifts the spirits for the rest of the day. Access is very easy (not one of those tortuous steep approaches which so often go with a view) and ample easy parking. To arrive you follow the long driveway through natural woodland and finally arrive at the fountain and fishpond outside the house. This unique hilltop position ensures total privacy. It is a nature lover’s paradise with the variety of different trees, such as olive, fig, mimosa, oak, pines, and an abundance of wild herbs. The therapeutic smell of the pines, lavender, wild thyme and marjoram, combined with the music of the cicadas and occasional golden oriole during the day, and the tree frogs and scope owl in the evenings, make this a truly magical place. But there is plenty to occupy you here. There is outstanding scenery with olive groves, vineyards, local gorges and rivers, and the surrounding hills change their aspect with the time of day and the weather – usually with varying shades of blue as they recede into the distance. There are 8 hill villages in the vicinity and each one holds free events, concerts and 'balls' throughout the summer. Sometimes its difficult to decide which one to go to. Fayence has a population of about 5,000, and hence is well provided with shops of all descriptions. It also has markets on 3 mornings a week. Markets are also held in the other villages, and at Le Muy and also Frejus plage there are huge markets every Sunday morning. The house and gardens are well equipped. There are new sunloungers and outdoor seating areas as well as good quality tables and chairs in various positions on the different terraces. The beds are mostly memory foam. The four bedrooms are all on the East side of the house, and on each floor there is a bathroom serving two bedrooms. Although 3 of the bedrooms are twins, they can be made into large doubles on request. We have lived in this area for many years now and so are well placed to help you with any questions you might have. We have travelled a lot on holidays, and think that this is the most wonderful area to be. It has everything - fantastic scenery, medieval villages, lots of good restaurants and shops of all descriptions. We originally moved to this area because although it was within easy commuting distance to the coast it was still very rural and unspoilt - as well as being breathtakingly beautiful. We bought an apartment in the village of Seillans, but after 3 years we decided that Fayence was a better place to be because it was larger and more lively. We update and refurbish the house on a continuous basis and always do our utmost to make sure the letting season goes smoothly without mishaps. The house is now a comfortable and spacious home carefully maintained, and we try to do everything possible to ensure that our guests have an enjoyable and trouble free stay. The grounds afford total privacy and plenty of space. It is away from roads and hence is peaceful and relaxing. As this is our home we are able to oversee the property ourselves and it isn't left to languish uncared for as is sometimes the case. When the house is let we live in our small apartment in Fayence village. We first saw an aerial picture of this place in an estate agents office, even before he had got round to putting it in the window. We were given directions and came round to see it straight away. Immediately we fell in love with it, and even though it was run down we could see its potential and imagine how it would be after care and attention was lavished on it. The interesting stone wall configurations, the well, the terraces, the long entrance drive culminating in a round fish pond in front of the house – to us it was a special place. Even the name was special – ‘La Pierre Qui Chante’ on a rusty sign hanging from the entrance pillar as we arrived that first time. We do have ‘a stone that sings ‘on the terrace in front of the kitchen doors. It rings when you tap it with another stone. No one knows why. We have traced La Pierre Qui Chante back to the land survey of 1849 - when they started doing them.The building was no doubt on this spot because of it's incredible situation. There is easy access from the road (no precipitous inclines) yet it has a commanding view. If it weren't for the trees it would be 360°. As it is you have views to the South and the North, with glimpses to the East and West. Consequently it is not overlooked and is completely private in it's 8 acre grounds. In spite of this it is very close to all the amenities that the area has to offer. The bathrooms are recently refurbished, a good size, and are light and airy. Free calls to many selected countries and to French mobiles. Each person has Bed linen, 1 small and one large towel. Also provided are bathmats, tea towels, hand towels in downstairs toilet and upstairs bathroom. Beds are made up ready for your arrival. New 9 kilo machine, plus a 6 kilo machine. A modern glass fronted insert is in the fireplace. There is a comprehensive and varied selection. Sky satellite with a new 1.2 wide dish, which is needed now in order to pick up UK channels. We have an an extensive library, mostly English, but also French. Terraces on 3 sides of the house, well equipped with furniture. The nearest tennis courts are 2km away near St Paul en Foret. There are more courts at the bottom of Fayence. The Terre Blanche golf resort is the nearest, about 10 minutes away. There are other courses in the region not far away. La Pierre Qui Chante has a table tennis table and a boules terrain. The area surrounding the house, including the terraces and swimming pool area is relatively flat. The pool is unfenced and quite close to the house, although the steps to it could easily be blocked by a barrier. There is a security alarm fitted to the pool. However, supervision of young children is always advisable where swimming pools are concerned. The fish-pond is also accessible, although it has a low wall round it and isn't deep anyway. Nevertheless, the fish would prefer to have it to themselves! To access the house itself there are 2 low steps, and the ground floor has 2 levels, separated by 4 shallow steps. Although 3 of the bedrooms are twins, it is possible to join beds together to make a king size if we are notified in advance. Telephone calls are free to French mobiles and also to fixed phones in many countries. We supply a list in the house. I would say the pictures do the house justice. It certainly has the French feel compared to somewhere ultra modern. It has everything you could need for a self catering holiday. There are no local shops that you can walk to but a 5-10 minute drive will take you to plenty of shops, bakeries and restaurants. I would recommend staying here if you want that true French feel in a lovely quiet location and you are happy to drive to places. Note that a rule is not to get in the swimming pool with sun cream on to prevent staining the pool liner. This can be hard work if you have children as you constantly have to put suncream on them and then take it off again as my child loved the swimming pool. We loved feeding the fish and their cat Miss Daisy. I can certainly see why there are a lot of good reviews. Pros: Beautiful home and location, all the amenities you need including a lovely swimming pool. Pleasant British couple owners who live close by for any support. Cons: We arrived on a Sunday around 1pm and found that no basic food & drink essentials were provided. This is the first self catering place we have paid for via a holiday home website where the owner has not provided some basics such as milk, butter and bread. Basically the fridge was bear. Luckily we found somewhere open past 4pm so that we could eat and drink, more importantly for my daughter. Towels are very coarse due to their age. I would recommend bringing your own if you prefer soft towels. Make sure you do not mark/scratch or stain any towels or kitchen utensils when you are there as the couple are very particular and will charge you from your deposit regardless of some of these items being somewhat worn and old already. We only make deductions from the security deposits in exceptional circumstances when guests have disrespected our home and items have been broken or damaged to such an extent that they need replacing. We have only done so on four occasions in fifteen years of letting because guests usually replace them themselves before they leave. Unfortunately when we make a justified reduction a guest may overeact. Too good to be true - but it is! La pierre qui chante is truly a hidden paradise! The house is marvelously pleasant, we felt at home immediately. Four lovely bedrooms, a very well equipped kitchen and an ample and cosy living room, we barely used because of the wonderful weather. The lay of the house and the pool is spectacular: views all around. The pictures on the website do not do it enough credit. It was our own private peaceful paradise. Star watching in the evening by the pool. Drinking rose in all the different seating arrangements at the various terrases. The pool is absolutely gorgeous and plenty of space around it to enjoy the sun or shade. Marjie and Tony are perfect hosts: showing us around and taking wonderful care of us. I would recommend La pierre qui chante to everyone! Marlies, Bernard and family were the guests that every host wishes to have. They took care of and showed respect for our property. Miss Daisy, the house cat was pampered and returned the favour by accepting them as if they were us. They were friendly and very appreciative guests and we enjoyed Bernard's wonderful sense of humour. It was such a pleasure to meet and get to know them and we would be delighted to welcome them back at any time, in fact, we sincerely hope that they will return. Our Norwegian family of four, two teenage friends of our son plus two of our best friends, a married couple from Sweden, spent a week at La Pierre Qui Chante during this year’s summer vacation. We took, in other words, full advantage of the villa. It was good to be back. So many things in this world change rapidly. La Pierre Qui Chante, Fayence and Provence doesn´t. Thanks! It has been four years since we were here last time, but it felt like yesterday. Tony and Marjie welcomed us like last time. Informed us of everything we needed to know, but it only took 5 minutes this time as we already knew the place and the surroundings. As Tony is a gentleman, he followed up by a few phone calls the next days, to make sure that everything was all right with us. Everything in the villa and the property is well looked after, well equipped and has everything you need. The total privacy and the property’s unparalleled location makes it a private paradise. Relaxing, swimming in the pool, barbequing in the evening, enjoying a glass of wine while looking at the wonderful scenery makes you forget the everyday buzz. I (the father of the house) am a runner, and a morning run in the nearby forests where you can smell the summer in Provence is highly recommended. We were happy to find Miss Daisy (the property cat) still around, the children loved it, even if she was hunting more on the night-time than last time in 2014. We shopped at Super U Fayence (supermarket) every day. Ate lunch in Fayence twice. Enjoyed a day trip to Cannes one day and visited a local Vineyard in one of the neighbouring villages another day. Our daughter and one went horse riding at Area Equestre at Saint Paul, just 15 minutes’ walk from La Pierre Qui Chante. But, most of the time was spent at La Pierre Qui Chante. We played table tennis, had a family Petanque tournament every evening, before we rounded the evening off in the living room with a good book and a game of Yahtzee. We will be back again, and we don’t think it is 4 years till next time. Thank you, Tony and Marjie. It was good to see Christian and his family again. They took good care of the house and also Miss Daisy who was very pleased that she got regular brushing and that the meals were on time. They were a very pleasant group and are always welcome. The house itself is totally private and very peaceful with lovely views from all sides. The outdoor living space is spacious and perfect for relaxing and soaking up the warmth of the Provençal climate; we have enjoyed hours of sunshine and blue skies lounging around the pool. There are a number of walks locally and opportunities for longer walks further afield; if you can tear yourself a way from the pool side! La Pierre Qui Chante is a comfortable home that is very easy to live in; it is spacious, clean and very well equipped with all of the necessary comforts and amenities. Marjie and Tony are warm and welcoming; they are great ambassadors for the region and have a wealth of local knowledge. We are eagerly planning our next visit in 2018. The perfect guests. They had a great respect for our home and on each occasion they left everything immaculate. Miss Daisy, the cat, gets totally spoilt for two weeks. They were good company with a great sense of humour and we look forward to the possibility of welcoming them again in the future. Lovely, spacious house. Gorgeous garden - eating figs fresh off the trees was a treat. Stunning views. Great location within an an hour of nice and Cannes - when we could drag the family away from the pool and the comfortable sun loungers. Tony and Marjie are very welcoming and have good knowledge of the area and places to visit off of the tourist trail. We're looking forward to a return visit. This was our second visit to La Pierre qui Chante. Having had such a lovely holiday in 2015, we couldn't wait to return and I hope at some point in the future we will go back again. The house is up in the hills and very secluded so the views are beautiful and there is complete privacy. The pool is in the sun all day and was perfectly clean. The owners had put in a new liner since our previous stay and also bought some very smart and comfortable pool furniture. Tony and Marjie are very friendly and helpful; close by if needed, but otherwise unobtrusive. We loved Faience which has a number of nice places to eat and a busy itinerary of evening events, dances, markets during the summer. On the way into Faience is a fabulous restaurant called La Table d'Yves, which is well worth a visit. We also visited Monaco, Grasse, Cannes and Nice. All in all a wonderful and relaxing holiday. It is always gratifying to know that our constant efforts to update and improve La Pierre Qui Chante is noticed and appreciated. Thank you so much for your kind comments. We look forward to seeing you all again sometime in the future - even if you don't stay here. We always enjoy meeting up with past guests. Long the dream location of Francophiles the world over, Provence with its views, light, colours and the smell of lavender in the air is intoxicating. The climate here is the best in France and visitors from Northern Europe come here to escape their own uncertain weather. Fortunately with all this popularity there is lots of space – especially if you venture here inland where rural life continues and you will find unspoilt countryside, vineyards and olive groves. This part of the South of France, set back from the coast, has retained its beauty whilst having every facility imaginable. Fayence is the main village in a group of 8 which constitute the ‘Pays de Fayence’. It is an ideal size (5000 inhabitants in the commune) – large enough to have all the facilities and infrastructure, yet still small enough to keep its character and village atmosphere. There is a cultural centre and outside theatre where shows and plays are held, and dances and summer events are held in the market square outside the church. Each of the villages has its own character, summer festivals, dances and events. There are markets, countless good restaurants, shops of all kinds, including supermarkets, bars, garages - and all of the villages provide free parking. There are gorges, lakes, and rivers to explore, vineyards and olive mills, making Fayence a fantastic holiday area. The house itself is between the villages of St.Paul en Foret (5 mins) and Fayence (10 mins). There is tennis, riding, golf, gliding nearby (all within 10 minutes), and also a large lake (St. Cassien) for water sports 20 minutes away. 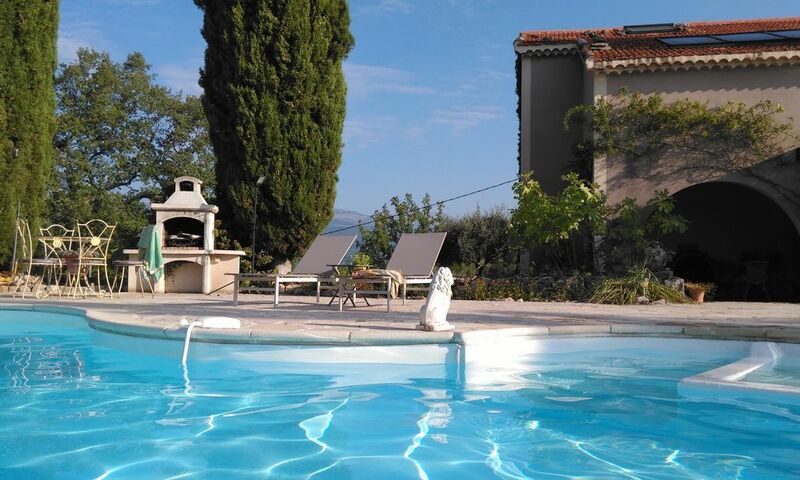 Fayence is about half way between Draguignan and Grasse, and Nice Airport is only 50 minutes away.